Ewan McGregor’s uneven adaptation of Phillip Roth’s Pulitzer Prize-winning novel “American Pastoral” extends the trend of Roth novels not quite hitting the author’s intended notes on the big screen. It also marks McGregor’s first foray behind the lens, which shows promise and may have borne bigger fruit had he not also cast himself as in the pivotal role of Seymour “Swede’’ Levov, a blond-haired, blue-eyed gridiron god looking starkly Scandinavian against fellow Newark Jews. Early reviews have claimed McGregor miscast, but yet none cite suggestions of who would work. Jude law, Andrew Garfield, Brad Pitt? The list is endless, but if you’re going to cry foul, have a bird in the hand. McGregor, the British actor who played Obi-Wan in the “Star Wars” films, is passable for the man delivered through the Greatest Generation and blessed with much. In the wake of the war he marries a non-Jewish beauty queen (Jennifer Connelly), takes over the family glove manufacturing business and moves out to WASPy Old Rimrock of Morris County. But as the 1950s shift into the 1960s, Swede’s world is upended by the women in his life: Merry, his sweet, effervescent daughter cursed with a pronounced stammer, witnesses the iconic monk immolation that swept TV screens in 1963 and blossoms into a radical activist (played with palpable turmoil by Dakota Fanning) who may be responsible for the firebombing of Rimrock’s post office that leaves a cherished townsman dead. Merry goes underground and Connelly’s Dawn has a nervous breakdown, only to rise an adulterous mass consumer moved on from the memory of her daughter. Swede never relents, and blames himself. Meanwhile the 1967 riots of Newark well up in the streets. Swede’s shop is mostly black, but he treats and pays his workers fairly, which helps mute the impact of the violence and the context of Civil Rights and Vietnam, prominent mostly through Merry’s antiestablishment anger and the occasional physical threat of a mob. Also greatly lost is Roth’s reliable framing structure, the POV of his observant alter-ego, Nathan Zuckerman (David Straithairn), who narrates the tale from a present high school reunion. It’s a wasted device, flimsy and inconsequential. McGregor too missteps as Swede early, not quite laying out the torment of a father and husband losing the women in his life and seemingly caught between extremes. Ultimately it gels – almost too late. What holds the film together are the women. Not just Fanning’s fiery rebel and Connelly’s lost, wanting soul, but Molly Parker’s unethically controlling shrink, Uzo Aduba’s sensitive office manager and mostly Valorie Curry, who provides spice as one of the counterculture activists who embraces and consumes Merry. Peter Riegert too, from “Animal House,” adds the old school Jewish swagger as Swede’s kvetching pa, but all these rich characters never quite meld onscreen. 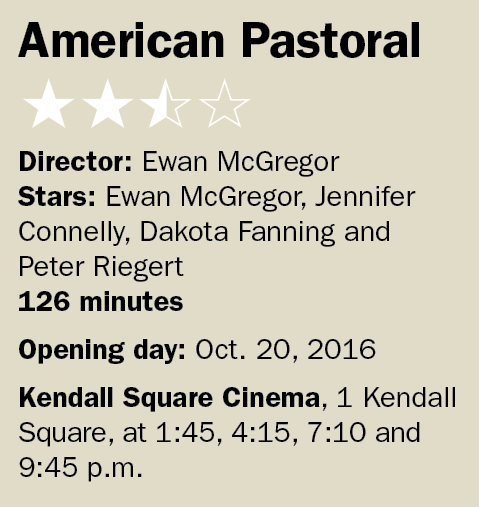 If anything, “American Pastoral” the movie is about loss and turmoil and a father’s love. That, at the core of McGregor’s vision, is heartfelt and true. What he misses are Roth’s culturally critical undertones, but that’s been missed before by others, including “Portnoy’s Complaint” (1972) and “The Humbling” (2014). The two most effective Roth adaptations, “Elegy” (the 2008 adaption of “The Dying Animal”) and “Indignation” (out earlier this year) were deeply intimate affairs. McGregor’s other ace in the hole is cinematographer Martin Ruhe and his set team who get the era and the texture down scrumptiously. There’s so much to like here, and the film ends with a punch. For Roth’s sake – and McGregor’s, for that matter – you almost want a do-over.